Boot shopping doesn't always go smoothly for women with narrow calves. 1 A Knee Length Skirt Goes With What Type of Boots? The prominence of boots in fashion has grown so much that they're worn with every type of outfit, and almost year-round. Boot styles range from casual slipper-like Uggs to sky-high rock-star platforms and spikes. For everyday wear, most women have a few pairs of sporty or dressy mid-calf, knee-high or above-the-knee boots. Wide-calf cuts have become increasingly easy to find, but women with thin or petite calves might have to look a little harder to find the right boots. Most boot legs have a circumference of about 15 to 16 inches at the widest part, but women with very thin legs may have calves that measure as little as 11 inches around. Wearing your boots over skinny jeans is one option that will keep the calves in place, but if you want to wear them with a skirt, you need to find a pair that fits well. Wearing mid-calf boots with slim ankles might eliminate the problem of trying to find a perfect fit, but they don't go with every outfit. For taller styles, you can try buying boots with stretchy leather or synthetic fabric calf areas, but even these might sag on your skinny legs. You might think lace-up boots or buckled styles are the answer; with an average calf size, though, they might not lace or buckle tightly enough. Pulling the laces too tight can make the boots look ungainly, which is not stylish. Nordstrom and DSW are among the few stores that specifically highlight narrow calves as a feature when you're boot shopping. The Nordstrom website lists more than two dozen boots classified as "narrow calf boots," with numerous styles. The brands include Michael Kors, Stuart Weitzman -- which has several narrow-boot styles -- and even Ugg. All of the boots on the site were priced at more than $100 at the time of publication, with some in the several-hundred range. The Tahari boots shown by DSW for women with slender calves are a bit more affordable, at less than $70 at the time of publication. The British store Duo specializes in narrow boot styles, with more than two dozen pairs ranging in price from $230 to $435 at the time of publication. Thin-legged U.S. women can order from Duo's website, which offers free worldwide shipping. If you want boots that fit like a glove, you can order a sturdy custom-made pair of leather equestrian-style boots from Poppy Barley. The company makes boots to order; you select your style and send your measurements, and the company delivers the boots to your door. 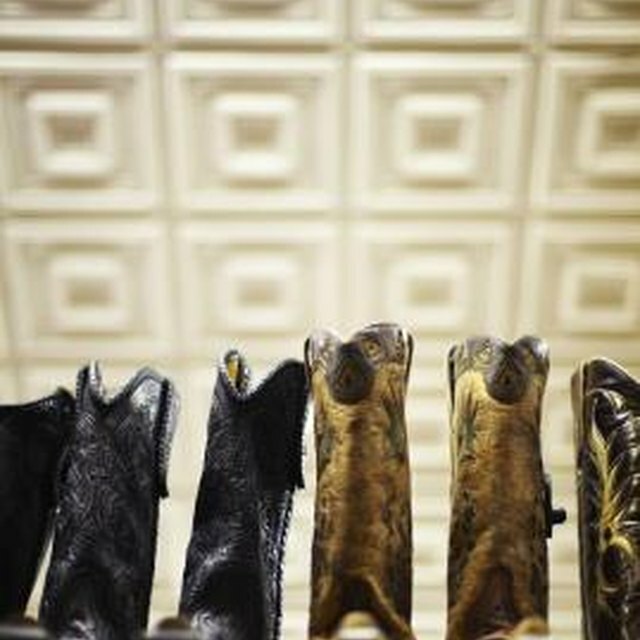 These handcrafted boots run in the mid-$400 range at the time of publication.